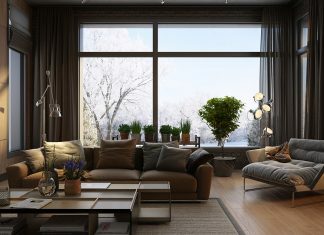 Roohome.com – Luckily there are some easy tips to decorate a contemporary spacious apartment design which extremely helps you a lot. Having a spacious apartment needs you to be smarter in designing and decorating. Therefore, the designer shows you the tips by using modern wooden accent ideas. You will be served by some wooden accents which decorate the apartment well. Do you want to see the design? Here there are! This amazing design is originally created by Shadow Architects. 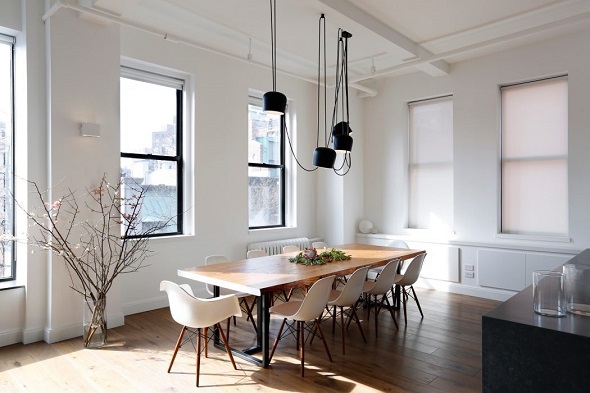 The designer is really brilliant in applying modern wooden interior ideas into a spacious apartment. First of all, the designer blends the wooden accents with a shade of white tone colors. If you want to apply wooden accents into your concept, you can blend the wooden with other bright tone colors. Because it can generate neoteric vibes in your apartment. This spacious apartment looks extremely bright and wider because of the designer utilizes some windows in order to get a natural light from outside. Well, you can try and follow this step as well. 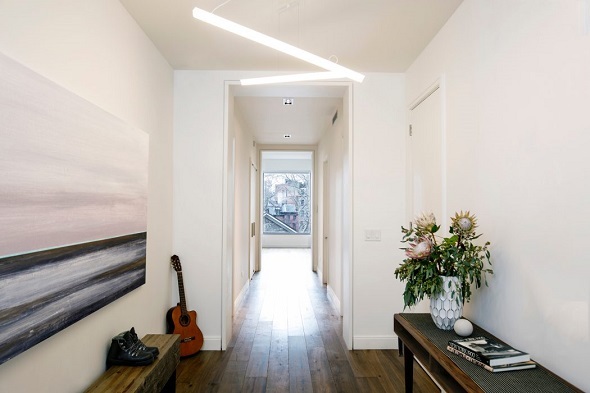 Move to the interior around the apartment is really equipped with modern wooden accents. If you want to decorate your kitchen as well, you can apply modern wooden interior and feature like the previous design. Shadow Architects combine a modern interior with modern wooden features all in one in this kitchen. 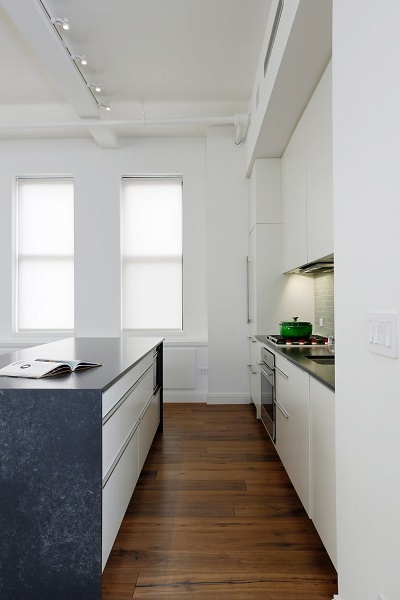 Therefore, the kitchen looks stylish even though the designer only uses a simple white kitchen set. The kitchen architecture is really dominated with wooden accents. The main material of the kitchen set is made by a wooden feature and near the place, there is a big wooden kitchen table. You do not need placing any decorations in this area because the area will become narrow and crowded. Meanwhile, the dining table is placed near the kitchen area. The dining table itself is made by wooden accents along with the dining chairs as the set. 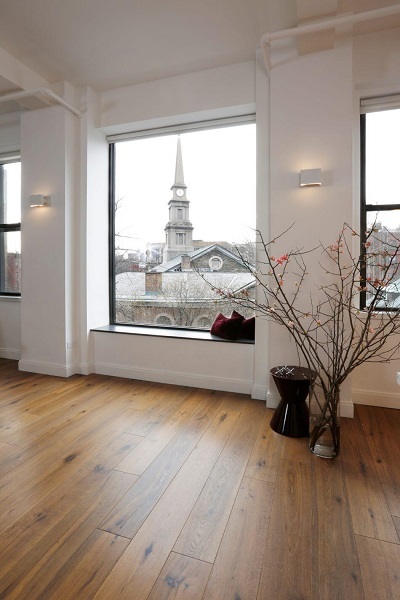 Near the dining table, there are some windows which enlight the area brighter and cleaner. For the interior itself is filled by a modern interior. 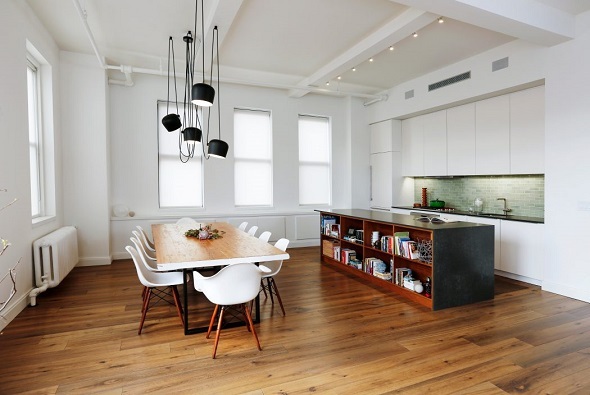 Having a modern interior for apartment design can be applied to a kitchen and dining room as well. Do not forget to find a better contemporary apartment design in here. Wanna see more? Keep scrolling. Having a spacious apartment makes you must be careful in arranging a modern interior in it. Therefore, the designer suggests you for placing some greeneries on the corner inside your apartment. Greeneries can help you to produce a natural appearance but you can combine it with a modern interior. You can add a simple wooden desk to fill some empty spaces near your living room. The desk itself can be functioned as a display desk. Do not place any ornaments along the corridor of your apartment. It can cut down a good appearance of your apartment. This contemporary spacious apartment design has inspired you a lot. Therefore, do not waste your time to apply this contemporary apartment design and tips start from now on. If you want to see other designs, just visit and check here. Have a nice day!